Having obtained estimates of k2 and h2, and confirmation that Io has an equilibrium shape, models of Io's interior density structure may be constructed to satisfy the Love numbers (which are not independent) and the total mass. With only two integral constraints, unique solutions are not possible, but families of likely solutions may be derived. The mean density of Io is 3,528kgm—3, and silicate volcanism (as well as abundant sulfur) is observed at the surface (McEwen et al., 1998). It is reasonable, then, to explore models of Io's interior consisting of an outer silicate layer and, possibly, a deep metallic core consisting of iron with some amount of sulfur. Nickel, which commonly occurs with iron, is a minor component of the core and is close enough in density to iron to make it indistinguishable for our purposes. The maximum tidal deformation of a body is achieved for a homogeneous density fluid, where k2 and h2 reach maxima of 3/2 and 5/2 respectively. Io's observed k2 Love number of 1.292 could be explained either by a density profile that increases toward the center, or by elastic stresses. Before pursuing differentiated models, we provide some results that arise from considering Io to be homogeneous in density but elastic. This will allow us to understand the limits the hydrostatic models place on the interior density structure. A homogeneous Io could exhibit a k2 less than 3/2 only through elastic strength which resists the tidal and rotational forces throughout the billions of years over which these have been acting. As pointed out above, it is unlikely that such stresses have not relaxed over that time, but we pursue this model to see what limits can be placed on the mechanical behavior and internal density structure of Io. where p is the shear modulus of the material making up Io. We can use this relationship to derive an upper bound on the shear modulus p < 2 x 108Pa. This is considerably lower than values typical for solids (1010 — 1011 Pa), indicating that Io's interior cannot be entirely solid. If Io is not homogeneous, but instead has a dense core, this upper limit is reduced further. Love numbers for differentiated bodies may be calculated using a method originally developed by Alterman et al. (1959) in which the deformations are decomposed into spherical harmonics and the resulting 6th-order system of differential equations describing the deformation is solved in a number of uniform property layers (Segatz et al., 1998). For a simple, two-layer body, however, the Darwin-Radau relationship provides an approximate (though highly accurate for the densities involved in planetary materials) relationship between the hydrostatic Love numbers and the density distribution. where C is the maximum moment of inertia, pm and p are the mantle and mean densities, respectively, and rc is the core radius. Figure 5.1 shows the core density (upper curves) and shell (mantle) density (lower curves) for the families of two-layer hydrostatic models that satisfy the observed k2 and total mass for Io. The measurement uncertainty on k2 is roughly the width of the solid lines. Also shown (dotted) are the densities of pure metallic iron, 8,000 kg m-3, and iron-iron sulfide eutectic, 5,150 kgm-3 (Usselman, 1975) at pressures of ~ 8 GPa, typical of Io's core. The hydrostatic curves show that models with shell densities in the range of silicate rocks and core densities in the range for iron-iron sulfide mixtures have core radii between 0.37 and 0.52 of Io's radius. These models have silicate mantles with densities similar to the Earth's uppermost mantle or the bulk Moon (3,250-3,300kgm-3). Lower mantle densities require cores that are not metallic, but are mixtures of rock and metal. We have shown above that the observations are consistent with an equilibrium shape for Io, but that does not exclude the possibility of elastic stress in, for example, a cold lithosphere. In order to alter the equilibrium shape of Io, this lithosphere would have to be frozen in when Io had a different shape, and it would have to maintain the stresses over billions of years. Since Io was most likely closer to Jupiter in the past, the frozen-in shape would actually be more distorted (less spherical) than the current forcing would dictate. Thus, the inferred structure would be less differentiated than the actual structure, causing the curves in Figure 5.1 to move away from the uniform density line. Although we consider it quite unlikely that Io's lithosphere is able to maintain such stresses over billions of years while magma courses through it to feed surface volcanism, elastic stresses would make our estimates of core size lower bounds. 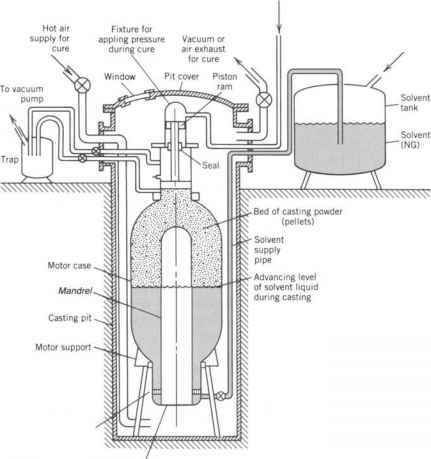 Figure 5.1. Two-layer models of Io consistent with the observed k2 and mean density. The mean density is shown as a thick solid line dividing the core density curve (above) from the shell density curves (below). 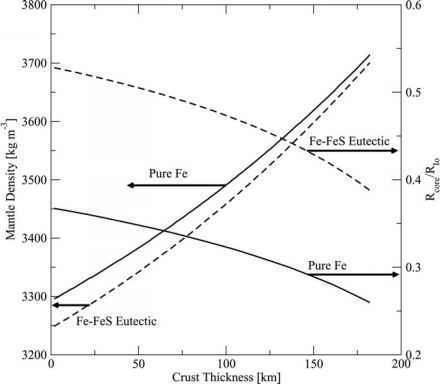 Also shown are the densities of pure Fe and the Fe-FeS eutectic. measurement uncertainty on h2 from the limb-fitting is too large to be helpful in this regard. A reduction in uncertainty by a factor of 2 in the h2 measurement would allow this constraint to be used, at least for certain classes of models, to constrain the product of the lithospheric thickness and shear modulus. Io's extensive volcanic activity suggests that the silicate mantle may be differentiated through the formation of a low-density crust (Keszthelyi and McEwen, 1997). We explore this possibility using three-layer models for the density structure (Anderson et al., 2001). In order to reduce the degree of indeterminacy in the models, we restrict the core density to the end-member values for iron-iron sulfide mixtures. The results are not strongly sensitive to the assumed density of the crust for reasonable values between 2,500 and 3,000kgm-3, so we use an intermediate value appropriate to basalt of 2,750kgm-3. Figure 5.2 shows the resulting hydrostatic models that satisfy the observed k2 and mean density as a function of crustal thickness. Figure 5.2. Mantle density (left axis) and fractional core radius (right axis) as a function of crustal thickness for the family of hydrostatic models satisfying the observed k2 and mean density. 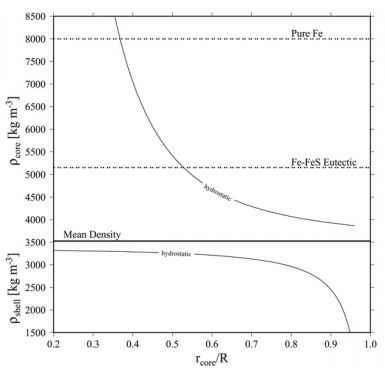 The crustal density is 2,750kgm~3, and the range of core densities is most likely encompassed by the curves for pure Fe (solid) and the Fe-FeS eutectic (dashed). independent of the density of the core. The radius of the core is mostly dependent on its density, ranging from about 0.35^/o for a pure Fe composition to about 0.5RIo for the Fe-FeS eutectic composition, for the same mantle density (3,300 kg m-3). Io may additionally have a partially molten asthenosphere, with a density intermediate between the differentiated crust and the unmelted mantle. With the constraints available, we cannot distinguish crust from asthenosphere and mantle. The smaller the density contrast between layers, the weaker the constraints on the layer thicknesses become. Such models are not inconsistent with the data, but the inherent indeterminacy makes them of little use.